I'm a little hesitant to post this, in the same way that David Blaine might not want to go around telling people how he does that levitating thing- It's one of my entertaining staples, and I don't want to ruin the magic of it. However, this recipe is so delicious and so easy to make that I would be doing you all a disservice if I chose to never reveal this secret. If you've been to dinner at my house enough times, you probably have tasted this puppy (and then subsequently died and gone to heaven) as it is pretty frequently pulled from my bag of tricks. In this week of holidays, this tart makes for a quick and easy treat. It's not fancy, but it's precisely the pureness and simplicity of the flavors that make it taste so darn good. If you stock a few easy ingredients, you can whip it up whenever the mood strikes you. Like pulling a rabbit out of your hat. 1. Preheat oven to 375 degrees. Open pastry sheet and remove paper. Fold sheet back up. On a lightly floured work surface, roll out pastry sheet (still folded) to an 8-by-14-inch rectangle. Trim edges with a pizza cutter or sharp paring knife. It will be hard to resist scarfing it all down immediately, but try to save some for the next day- abracadabreakfast! 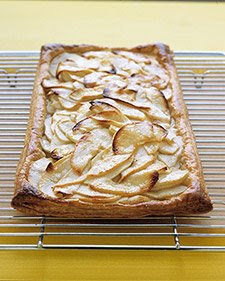 i have a couple of apple tart standy-by's that my friends have seen numerous times as well. we all need dependable recipes.